How Do I Use Concrete Rust Remover? How can I remove rust stains from my concrete sidewalk, driveway or patio? This question comes up almost daily here. The usual scenario is the customer has spread fertilizer, gotten some on the concrete, and now they have unsightly spots of rust. There are other causes too, perhaps water collecting under an iron plant stand, maybe drips from a golf cart battery, and it isn’t always concrete. Stones, pavers and bricks are frequently rust stained as well., but whatever the cause and location, there is an easy and effective solution. The solution is Concrete Rust Remover. It’s a powder that you mix with water, and it removes rust stains from concrete, stone, brick and even black top. 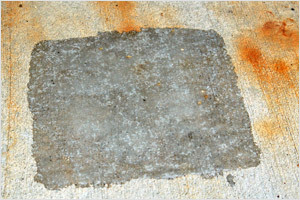 Concrete Rust Remover is easy, safe and yes, it really does work. Concrete Rust Remover is easy to use. Start by figuring out how much you will need. A single 22 oz. container will cover about 60 square feet. Make sure you get enough as it doesn’t work well if spread too thin. Then just mix it, spread it, let it sit and rinse it off. We always recommend that first time user start with a test batch of the Concrete Rust Remover. It really is the best way to familiarize yourself with the product. Keep in mind that every paving stone and piece of concrete is different, and it is always a good idea to try the remover on an out of the way spot to make sure you are satisfied with the results. When handling Concrete Rust Remover, keep in mind that while not considered hazardous, it is a skin and eye irritant, and it can remove the color from cloth. Gloves and glasses are not a bad idea, and it’s advisable to wear old clothes. Get a big enough container and gather your water. Use warm water whenever possible, the powder will mix better. A 22 oz. container mixes with one gallon water so mixing a full batch is straight forward, but for smaller amounts the ratio is three tablespoons powder to one cup of water. Make only as much as you need, and remember that for larger areas, there is nothing wrong with working in sections. (Please note: The mixed solution will lose its rust removing ability over time. It loses about half its effectiveness in four hours so only mix up as much product as you'll be using at the time. 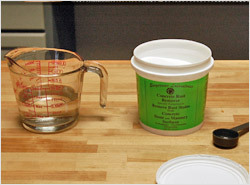 The remaining powder concentrate will remain stable when stored in its container with a tightly sealed lid). 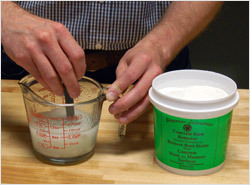 Add the proper amount of the powder and stir thoroughly. Don’t be in a rush, it takes time for the powder to get completely mixed in. Lumps will form while stirring the mixture. You should break them up as much as possible, but if a few remain it’s not a disaster. Keep stirring until the mixture is uniform, thick and milky in color. 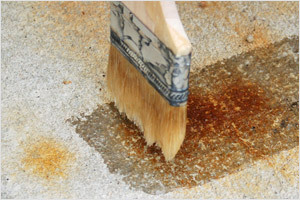 Concrete Rust Remover can be applied with a brush or roller. It can even be poured or trowelled on. However you apply it, don’t skimp, apply a thick coating (approximately 1/8"). It is much less effective if spread too thinly. For heavy stains or on uneven surfaces, use a scrub brush and work the mixture around thoroughly. You’ll need to rinse the product off before it dries, so don’t try to do too large an area all at once. It is often more effective to work in sections. After application, let the Concrete Rust Remover sit for a while. Some stains may start noticeably lightening almost instantly, but others will take some time. 15 minutes is the typical time, but it may take longer. (The recommended test batch will help you determine how long you need to wait for your project.) Be careful not to let it dry on the surface. If it is drying, rinse it off thoroughly and reapply a fresh coat if not all the stain has been removed. The need to rinse Concrete Rust Remover off before it dries is primarily why working in sections on large areas is recommended. Also, keep in mind that hot conditions or wind will speed up the drying time and plan accordingly. (Early morning or later evening hours may be better and the sun will not be as high in the sky and contribute to excess drying.) If it does dry in place, apply a fresh coat over the dried and rinse both of them off. 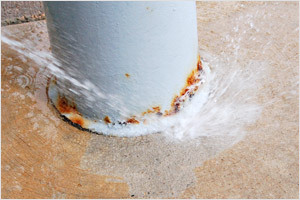 To remove the Concrete Rust Remover from the concrete, rinse it off with water. It may have gotten thick while sitting, and it is a bit sticky, so use plenty of water. A standard garden hose works well (high pressure is not necessary). 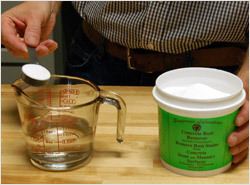 The gel is water soluble and will loosen up even with low pressure. 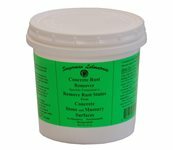 Concrete Rust Remover is biodegradable and safe for your plants. There’s no need to worry about the rinse water harming your lawn. Just use enough water to dilute well upon rinsing. For most rust stains, one application will take care of the problem. However, some surfaces will need a second application to completely remove very stubborn rust stains. That really is all there is to it. If you have spots from fertilizer on your sidewalk, drip marks from a battery that overflowed on your driveway, or rust stains on your patio pavers, then Concrete Rust Remover is the product we recommend. Questions about removing rust from concrete?